I'm currently at ~70% win rate with the deck. 1. Innately strong strategy. Left unmolested you build a huge board very quickly. 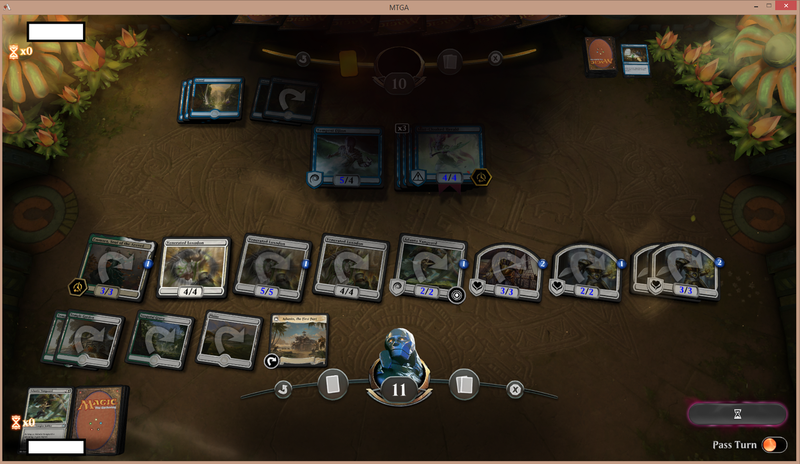 Something like Emmara into History into Venerated Loxodon means your board spirals out of hand really fast. 2. You make one-to-one removal look utterly embarrassing. The only "good" target is Trostani (and that still leaves two 1/1s on the board). 3. Did I mention you end up with a huge board very quickly? Your board gets so big that you can convoke Venerated Loxodon and March of the Multitudes and still have bodies to chump block the opponent's biggest attackers. 4. 21 land deck. Yes, you will mana screw some of the time, but you also flood less since Flower//Flourish is a real spell later in the game. It's not the best imaginable spell, no, but it (together with March of the Multitudes) is similar to the banned Splinter Twin combo in Modern. Incidentally, this is the way a large fraction of games vs. B/G ends. 5. You rarely color screw, even with only 21 lands. You even have enough colored sources to run the utility land Arch of Orazca. 6. March of the Multitudes is very powerful. March into March can dump like 15 tokens into play over two turns at instant speed, and they even have lifelink. 7. You run Adanto Vanguard. This card is almost a one-card win condition against some decks (especially those in the blue/red color combination), and against white decks with exile removal like Conclave Tribunal, you have Knight of Autumn to free your Vanguard. 1. Loses to board sweepers. Bleagh. Adanto Vanguard helps to some extent, but all the tokens disappear instantly to the likes of Cleansing Nova & Ritual of Soot. You can rebuild quite fast, but there's no good way to play around the sweepers. GW has no Duress or Negate against these cards, either. 2. Ajani has the curious weakness of not being able to -2 very often since the only return-able 2-drops are Emmara and Adanto Vanguard / Thorn Lieutenant. Vanguard tends to stay on the battlefield, leaving just Emmara (if you're not running Thorn Lieutenant). However just the +1 mode is still quite good (buff the lifelinkers & History of Benalia knights, or just get your creatures out of range of damage-based board wipes), and you tend to have loads of chump blockers to threaten the ultimate. 3. Weak to flyers. You can't block them, and there are only four Conclave Tribunals. Only thing that can be done is gain life to offset the damage, or have sideboard cards at the ready. 4. Weak to control. This is an extension of #1. You have no Duress or Negate etc to help force your damage through. Settle the Wreckage is a significant problem as well, since the only thing you can do is attack and hope (or play Shalai, but Shalai is not effective against control anyway). 5. Against another deck that looks to sit there and go off, you can't interact much. I got annihilated by an elves tribal deck that went Llanowar Elves into Marwyn into Steel Leaf Champion (speaking of which this card is also deadly since it's not chumpable). As I mentioned earlier, there're only two flexible slots in the standard decklist. - Adanto Vanguard is better when you want to be aggressive. It not only attacks for the most damage, it's the hardest to remove. Against control decks, it's your only 2-drop that survives Deafening Clarion & Ritual of Soot. - Saproling Migration is the weakest of the four in terms of power level, but it contributes greatly to your best draws since it doesn't cost you mana if you're going to convoke something. Something like T2 Saproling Migration into T3 Venerated Loxodon dumps 8 power onto the board by turn 3. No other 2-drop lets you do that. - Emmara is a one-woman army. If the opponent is clearly sandbagging a Ritual of Soot or other board wipe, Emmara can easily force the sweeper on her own. She's also great with convoke for obvious reasons. Drawbacks are she dies to Shock & Fiery Cannonade which Adanto Vanguard and Thorn Lieutenant survive, and she's legendary which is why standard lists only run three. - Finally, Thorn Lieutenant is by far the best of the four options at blocking. If you are the control deck (e.g. vs. Monored), then Adanto Vanguard and Saproling Migration are actively bad (neither card are very good at blocking the 1-drop Ghitu Chronicler for example), but Thorn Lieutenant is amazing. Standard lists run Adanto Vanguard, Saproling Migration and Emmara, trusting on the rest of the deck to beat up on aggressive strategies. This actually works quite well, since a card like Trostani or March of the Multitudes can single-handedly win the game against them. On the other hand if you're on the draw and looking at a hand of Adanto Vanguards and Saproling Migrations against an opponent with Runaway Steam-Kin, knowing Goblin Chainwhirler might come next, it'll feel really stupid. Ultimately, it is up to you. - As mentioned above, Ajani has the weakness of not being able to -2 very often. On the other hand it's a planeswalker that survives sweepers, and it can also buff your creatures out of range of sweepers. You also tend to have lots of chump blockers to threaten the ultimate with, although it's rare to be able to get there. Do note that as a planeswalker it has some anti-synergy with The Immortal Sun, which is an important sideboard card for you. - Shalai is semi-resilient to sweepers (she survives Clarion & Ritual of Soot), protects against Settle the Wreckage (your only way to do so in fact), flies (which is good since you are weak to flyers otherwise), and provides a late-game mana sink. However she's very vulnerable to the likes of Ravenous Chupacabra and Find//Finality. It's also rare that you'll be able to sink mana into her because you have other mana sinks (March & Arch of Orazca especially); in fact after many games with her I think it's come up only once for me. Finally, as a 3/4, she lacks a crucial point of power to be able to tangle with the most common flyers: Drakes and Tempest Djinn. You can conceivably boost her with herself, Trostani or Venerated Loxodon, but probably not Ajani if you're running Shalai. The sideboard is where the real choices are made. Nobody can tell you what the best sideboard is; you'll have to adapt against the meta you're seeing. Knight of Autumn - this powerful sideboard card is primarily an answer to enchantments. This can be History of Benalia, Seal Away / Ixalan's Binding etc, or Experimental Frenzy. It's common to have at least three copies of this card. It's true that Vivien also kills enchantments, but a 5-mana card that can't be convoked is not easy to cast. Knight of Autumn's other modes also come up, and she is fine against aggro decks as well simply for the +4 lifegain (although you have plenty of other ways to gain life). Note she is a knight, i.e. she's buffed by History of Benalia's 3rd chapter. Baffling End - a sideboard staple, this allows you to remove early creatures if you have to. Most early creatures can be ignored (taking damage isn't even that bad with this deck, since you have plenty of lifelink), but there are a few that you want to remove on sight. The most important of these are Runaway Steam-Kin, Enigma Drake, Benalish Marshal, Wildgrowth Walker and Goblin Electromancer. Ixalan's Binding - sideboarded games tend to go longer, so sometimes you need more removal for your opponent's threats. Ixalan's Binding is such a removal spell. It's especially good against decks that only have a few threats, especially Drakes (they can't remove it too!). You still can't run too much removal since you are a proactive deck, not a reactive one. If you run this, the standard number of Ixalan's Binding is two. Citywide Bust - quite common as a one-of. Most of your creatures are small, making this potentially a one-sided sweeper. This kills drakes, Niv Mizzet, big Wildgrowth Walkers, Carnage Tyrant, Doom Whisperer, Lyra, the list goes on. This will also kill your own creatures if you make them big enough (with Trostani / Ajani / Loxodon) though, and it will kill Trostani and Loxodon regardless, so handle with care. Settle the Wreckage - its main purpose is the "synergy" with March of the Multitudes. If you pass without doing anything, the opponent might assume you have March and overextend into this. Don't run more than one though, because again, you're not a control deck. You need some of these since you have no way to block them otherwise. Plummet and Crashing Canopy - as mentioned before, one of your weaknesses is to flyers. These explicitly target flyers. The only problem is they're so very narrow. Kraul Harpooner - same as Plummet and Crashing Canopy, except it can also be played as a 3/2 threat that incidentally has reach. The main problem with Harpooner is that you need one creature card in your graveyard before it can actually kill the cards most worth killing (drakes & Tempest Djinn). You make lots of creatures, but don't actually have many creature cards. He's also unable to kill Niv Mizzet and Lyra Dawnbringer. On the other hand, Harpooner can still chump block. Worth noting that if you have Trostani on the board then Harpooner fights as a 4-power creature even with an empty graveyard. Lyra Dawnbringer - same as the above, this is a drastic card to bring in against flyers, but she does block everything except Doom Whisperer. She is not that hard to kill though, being particularly bad against Ravenous Chupacabra. Control decks with lots of sweepers are bad matchups, so you'll need some of these. Vivien Reid - One of your best threats against control. I also board her in against decks with big flyers like Doom Whisperer or Lyra Dawnbringer. Two copies is very common. I'd love to run three, but again, a 5-mana card that can't be convoked is not easy to cast. All this said, there's an argument for not running Vivien at all: 1) she doesn't have that many hits since a lot of your creatures are spells, and 2) anti-synergy with The Immortal Sun. Karn, Scion of Urza - see Vivien Reid, except Karn is explicitly to grind. He is only useful against control and to a lesser extent Golgari. You can conceivably sideboard him also against monored since his high starting loyalty helps him survive and generate card advantage, but he wouldn't be impacting the board the turn he comes down. If you run him at all, I advocate only one copy since he's so narrow. The Immortal Sun - this is a very powerful win condition, almost as strong as some planeswalker ultimates. The problem is it's expensive + removable. Still, if it sticks on an even board you are virtually always going to win. It's one of your best cards in the mirror, against Golgari, and against various rogue decks where you might have bad cards to board out but nothing else is really effective. One copy is common, sometimes two. It's not the best hate card against control, but it's better than nothing. Carnage Tyrant - a dedicated anti-control card. He survives most sweepers, cannot be countered, and cannot be chumped. However if casting a 5-mana cannot-be-convoked card is hard, casting a 6-mana cannot-be-convoked card is even harder. I'd only bring in Carnage Tyrant against control. He looks fantastic against drakes, and he is if you can cast him soon enough, but there's a good chance that by the time you're casting Tyrant, you're already dying to their drakes. Nullhide Ferox - a 6/6 hexproof is really hard to remove for many decks, and he survives most sweepers as well. Nullhide Ferox is at his best when you curve out with him, since the opponent will have to sweep (and take 6), or answer him (and your earlier creatures get to attack). There're very few cards that answer him at mana parity as well, and as a 6/6 he also brawls well: you can easily push him into the red zone against drakes for example, when your next best cheap threat Adanto Vanguard even needs a boost to get through. However, the drawback is real. You have lots of noncreature spells. Against control decks you can just sit behind him until they answer him, but against decks like Golgari, they can take 6 and develop their board while your own development is slowed. He also lacks trample, which is important against Murmuring Mystic out of the drake sideboard. If you run Nullhide Ferox, I advocate all four copies. It's an all-or-nothing sideboard card. - Legion's Landing: usually the first card out since it's your weakest maindeck card, plus opponents will probably have more board sweepers postboard, making this less useful. - Adanto Vanguard: depends on what the opponent's deck is. Vanguard blocks poorly, so if you're the control deck you don't want him. In some matchups he's also unable to attack often (e.g. against Wildgrowth Walker) in which case you can board him out. - March of the Multitudes: it's powerful, but slow. Against very aggressive decks, you can board down some copies. In theory it's also bad against decks with lots of sweepers, but those are usually control decks, against which March being an instant-speed threat is still good. - Ajani: if you can't guarantee a board, e.g. against very aggressive decks, and against primarily-flying decks since you can't protect him well. - Saproling Migration: against decks with loads of sweepers. Try not to cut too many copies since every Migration you cut weakens your convoke cards as well. - Venerated Loxodon: against decks with loads of sweepers. Loxodon isn't bad against sweepers, but since you'll be boarding out low-drops against them, there's less to convoke Lodoxon with. - Trostani: if you're bringing in lots of expensive creatures then you have to cut Trostani to keep your curve reasonable. Golgari: game 1 by far their best card against you is Find//Finality. Play around it if possible, otherwise just jam. Games 2 and 3, Find//Finality is still a big issue, and they're also likely to have Ritual of Soot or Golden Demise as well Doom Whisperer. You want to diversify your threats with more cards that survive sweepers. A lot of this matchup hinges on how many sweepers they draw, and if you draw removal for their best threats (Doom Whisperer & Vraska Relic Seeker / Vivien). The ground usually gets quite clogged, so Carnage Tyrant is not so much of an issue. Most commonly, you'll win either with the Splinter Twin combo (March into Flourish) or by out-grinding them with planeswalkers and anthems. I don't like Nullhide Ferox in this matchup - yes, they can't easily kill Ferox and he'll get to rumble, but they can easily take 6, 12, or even 18 while your development is stymied. Good cards in this matchup: The Immortal Sun, Baffling End (answers Wildgrowth Walker), Vivien & Karn, Citywide Bust. You can also consider Ixalan's Binding if you have space. Tocatli Honor Guard is also a haymaker against Golgari, but it conflicts with Loxodon & Trostani. Bad cards in this matchup: Adanto Vanguard (can't attack past Wildgrowth Walker; early pressure seldom matters also), Shalai (because of Chupacabra), Legion's Landing (expect sweepers postboard). Drakes: this is a bad matchup. Their best threats all fly, and they're all capable of killing you quickly. Further, they're also good blockers. Preboard your best bet is to develop your board to the maximum. Make sure you use every bit of mana available to you, with maximum convoke. Buff Adanto Vanguard to 4-power when attacking (enough to attack through a drake) and hope. Standard decks run lots of sideboard cards for this matchup, and it's possible to tilt the matchup back to even. Aside from bringing in Fiery Cannonade, they usually don't improve too much. Be careful with your curve after sideboarding, because if you both play draw/go they'll eventually stick a drake which you can't remove (or protect it against removal with Dive Down and Spell Pierce), and kill you. Good cards in this matchup: Baffling End (removes Electromancer & Enigma Drake), Citywide Bust (kills all drakes + Niv Mizzet), Lyra Dawnbringer (it's Beacon Bolt or take a 2-for-1 for them), all your anti-flyer cards, Nullhide Ferox (unless they have Murmuring Mystic), Ixalan's Binding (they don't have that many threats and casting this on a drake is a big deal), Vivien Reid (kills their flyers). Bad cards in this matchup: Ajani (you can't block drakes), March of the Multitudes (it's quite slow against their explosive turns), Legion's Landing. There's an argument against Emmara being bad as well (dies to Shock & Fiery Cannonade), but the same applies to Saproling Migration and she's still a great convoke body. Further it only takes one buff to get her out of range. Control: this is bad pre-board and usually improves greatly afterwards. Adanto Vanguard is your key card and you never want to let it get countered; you also never want to walk two or more Vanguards into a Settle the Wreckage. Play around the sweepers as much as possible. Ideally you force them to sweep, and take the window to resolve a planeswalker. Use Ajani's +1 to get your creatures out of range of Deafening Clarion; use Ajani's -2 to protect against The Eldest Reborn. Expect loads of sweepers after board from them. I've been hit by all of Settle the Wreckage, Cleansing Nova, Deafening Clarion, and Star of Extinction from Jeskai lists. The blue-black versions will still have Golden Demise and Ritual of Soot. Good cards in this matchup: everything anti-control, Knight of Autumn vs. white enchantment removal, Ixalan's Binding (this kills all their threats), Nullhide Ferox. Nullhide is also exceptionally effective against Dimir control with their discard effects. The Immortal Sun is also okay, but being counterable means it's significantly less powerful than the other anti-control cards you have. Against the Jeskai lists, in the dark, I usually bring in Knight of Autumn; however if you are sure they are on a creature-heavy version with Crackling Drakes, Niv Mizzet, Lyra, etc, then don't bring it in. Bad cards in this matchup: Thorn Lieutenant (dies easily to sweepers), Legion's Landing (ditto), Saproling Migration & Venerated Loxodon (as usual, caveats apply about diluting your gameplan too much when boarding out these two cards). March is not bad - yes they'll have loads of sweepers, but it's still an instant speed threat that you can use to force them to tap low on their turn. Monoblue: they're a high-variance deck. Sometimes their draws are unbeatable, and sometimes they'll just lose to themselves. You are favoured nonetheless, since they can't really interact with you. Build your board and don't even bother trying to remove their creatures unless they have no mana up. This is my favourite screenshot of the matchup - just look at their hand size and their board. https://i.postimg.cc/Jz2YnBN8/Untitled.png. Be careful not to attack Adanto Vanguard into two open mana because of Merfolk Trickster. This is one of the matchups where Shalai is better than Ajani - in addition to blocking their smaller flyers, she also disables Sleep. I've not played enough of the matchup to tell what it's like post-board, but I don't see why you'd not be favoured. Good cards in this matchup: Baffling End, Knight of Autumn (target their Curious Obsession), anti-flyer package. Kraul Harpooner is especially good since you can kill Siren Stormtamer with it for free. Lyra is also good since it's really hard for them to get past Lyra if she resolves, just make sure to bait counters with other spells first. Bad cards in this matchup: March of the Multitudes (the game will end way before this card starts getting impressive, besides Spell Pierce is deadly), Adanto Vanguard (they have 1/1s to block with; if you pay that's like the 1/1 attacking for 4). Not a fan of Vivien Reid either - too expensive (+ Spell Pierce counters Vivien). Monored: this is the matchup where Thorn Lieutenant & Shalai are at their absolute best. You're the control deck. Build a board and lifelink your way out of burn range while playing around Goblin Chainwhirler if possible, e.g. by playing Saproling Migration and Loxodon on the same turn. If you get the chance to trade Adanto Vanguard for a card you should do it because he's such a liability against Chainwhirler & Fanatical Firebrand. Warning: your opponent can play burn spells on Adanto Vanguard in response to you paying four life. I once attacked Vanguard into Fanatical Firebrand, opponent blocked, I paid, he sacrificed in response. Don't make mistakes like that. Post-board it's imperative to have answers to Experimental Frenzy. Rekindling Phoenix is a potential threat as well. Good cards in this matchup: Lyra (untap with her and you almost win), Knight of Autumn (both to gain life and to kill Experimental Frenzy), Baffling End, Shalai. Bad cards in this matchup: Adanto Vanguard, Legion's Landing, March of the Multitudes (you probably don't have time to cast this for a lot, unless you're already winning), Ajani (as is usual against very aggressive decks). Selesnya Tokens: build a huge board and win with an anthem effect. Life totals barely matter in this matchup, since it's unlikely either player will be overrun. March of the Multitudes is by far the most important card, and there's a good chance the player that draws more Marches wins. Good cards in this matchup: The Immortal Sun, Knight of Autumn (kills their Conclave Tribunal / Ixalan's Binding), Vivien Reid (ditto). If you have space you can also consider Lyra, since she flies over all their blockers; however she is vulnerable to removal & Vivien, she doesn't synergize well with your tokens, and you absolutely don't want to be boarding out Trostani in this matchup so she's hard to fit into your curve. Bad cards in this matchup: Adanto Vanguard (they have loads of 1/1s that he can't attack through). If opponent is boarding out Adanto Vanguard (and they should) then Legion's Landing also gets weaker since it's so low impact. Boros and white aggro: your 1/1 tokens match up really well against their 2/1s, plus you have a lot of lifelinkers to get out of range of Banefire. If you have a functional draw you are very much favoured, with cards like Trostani effectively being worth three of their cards. You even improve post-board with your anti-enchantment package. Thorn Lieutenant & Shalai are better than Adanto Vanguard & Ajani in this matchup. Try to save Conclave Tribunal for Benalish Marshal. Bad cards in this matchup: Adanto Vanguard (as is usual when you're defending), March of the Multitudes (since it's slow), Ajani if you need space (you might not be able to protect him well enough). If their post-board configuration is suspiciously short of x/1's, you can board out Legion's Landing also. - Your total mana available for convoke is your land count + your creature count. When maximizing your mana spent, you need to count not only this, but also new creatures, Legion's Landing flips, Emmara tokens, and so on. Example: post-board against Dimir control, on turn 4, your board is Emmara, Adanto Vanguard, 1/1 lifelink token (from Emmara), 1 Plains, 2 Forests. Opponent's board is 3 lands. Your hand is March of the Multitude x2, Legion's Landing, Venerated Loxodon. Notice that you can cast Legion's Landing, attack with all three creatures (makes another 1/1), flip Legion's Landing, and still have five mana to convoke Loxodon, leaving you two creatures that survive a possible Ritual of Soot on the next turn. It's not obvious. You must do the math. - History of Benalia is the hardest card in your deck to cast pre-board, so keep that in mind when casting Flower//Flourish. Post-board, if you board in Nullhide Ferox/Vivien/Carnage Tyrant, you'll need 2 green mana as well. - Remember to play the land you get with Flower//Flourish before others if possible (of course don't play basics before Temple Garden if you're able to save two life that way), to conceal information from your opponent. - You can put all your lifelink tokens in front of an attacker to gain life. For example if opponent attacks with a 2/2 and you have 10 lifelink tokens out, you can block the 2/2 with all of them to gain 10 life. - You might not want to trade if saving the creature for convoke. For example your 2/2 Knight token for your Boros aggro opponent's 2/2 Knight token is not a good trade if you're holding Venerated Loxodon. - If you manage to put a +1/+1 counter on Trostani, Venerated Loxodon will also survive Find//Finality. - Don't be afraid to trade Emmara away if you're still getting a 1/1 token out of it. I'd happily attack Emmara into a 3/2 Merfolk Branchwalker for example - you still have a token to convoke with. Some less-experienced opponents also go out of their way to remove Emmara, in which case you don't have to go out of your way to free her (with Knight of Autumn or Ajani -2 etc). It's an option, but remember she's still a 2-drop and less effective late-game. - Don't forget to attack with History of Benalia tokens before convoking! - Also don't forget that if your plan is to use March of the Multitudes, you should use it in response to opposing removal. This is especially the case if your Thorn Lieutenant gets hit with removal: after the ability but before the removal spell resolves, you can March for one more token. - If you're running Shalai / Thorn Lieutenant remember you can attack with them @ 6 mana, but decline to activate. For example you can attack Thorn Lieutenant into your opponent's Doom Whisperer. If he blocks great, you activate and kill him; if not you can just do 2 damage and use the mana another way. A word of caution here though, your opponent can cast removal in response to the Shalai / Thorn Lieutenant activation. - Trostani has a second ability. It almost never matters, but don't forget it's there. The most realistic way of it happening is against Thief of Sanity, Hostage Taker, The Eldest Reborn targeting one of your creatures, and Entrancing Melody. Last edited by Banedon on Fri Jan 11, 2019 12:19 am, edited 18 times in total. What about Kraul Harpooner? Can be gotten back by Ajani, is a decent blocker and kills fliers. It'd be a sideboard card. I don't see what it's that good for however: the only flyers you're reasonably fighting is Rustwing Falcon / Healer's Hawk / Siren Stormtamer. It's not like it's a good blocker either: it can't block Lyra, Tempest Djinn, etc. I see many published lists running this card in the sideboard, but I'm skeptical other cards aren't better (unless I'm missing something). I've lost several more games now but the win rate is still solid at ~70%, and it feels like the deck does really powerful things so after having played it a lot, I don't regret spending the wildcards. I do want to try the GW midrange deck at some point though, not sure if I want to craft that first or fill out the sideboard first. Also lol I beat the Boros "super nut draw". Opponent went Healer's Hawk into Ajani Pridemate into Healer's Hawk + Ajani's Pridemate into a third Pridemate. His board was extremely intimidating. But I was able to hold off the Pridemates with my little tokens with Loxodon backup (they couldn't attack favourably given what the backswing would be), and then had back-to-back March of the Multitude. Result, opponent died from 28 life in one attack, and I didn't even have an anthem effect. I don't get it. With 2 creatures in the yard it kills Lyra, with 1 loxodon trigger it easily chumps and kills Djinn. Of course it’s not optimal. Other than that you can run ixalan or settle at 4 cmc and hit creatures/all single targets or seal away at 2 cmc and hit problematic creatures. Dunno what the biggest problem for GW is, as I have never played it. Other than that if you want to race (what I don’t believe) youhave kinjalli’s sunwing in white. Btw. Any reason to splash black for some goodies? 1. Nullhide Ferox is quite mean against control decks. It costs at least 4 mana to answer if not countered. The Dimir/Grixis versions would even need 6 mana (Vraska's Contempt + pay for ability), with all the sweepers ineffective as well. 2. Kraul Harpooner actually has some use against Drakes. With a Trostani in play, or simply with chump attacks, it kills a Drake (and monoblue flyers of course). 3 power still really isn't ideal though. I get the feeling it's showing up in sideboards because it's a reasonably-sized creature with some utility, something you can board in against the likes of Goblin Chainwhirler. Nonetheless, 3/2 still dies to Golden Demise and Fiery Canonade. 3. The deck's weakest matchup by far is control. I wonder what can be done. Adanto Vanguard and Nullhide Ferox are a start, but Ajani isn't a good threat vs. control even though it's a planeswalker. The Immortal Sun sounds like it's good, but it also turns off Vivien Reid. Maybe run Karn? I wouldn't worry about that. You don't need Vivien if you have Immortal Sun sitting on board. You'd have the card draw engine, the reduced casting costs, and opposing planeswalkers would be shut down, too. The Immortal Sun is absolutely excellent and I could see an argument for it being main-deckable. Tell me what you think of siding in Nullhide Ferox vs. Golgari? Pros: it's a 6/6, it can often attack into Wildgrowth Walker and Doom Whisperer, and it trades with Carnage Tyrant. They're also unable to kill it easily since it survives Find//Finality and Golden Demise. Chupcabra, Vraska Relic Seeker and Vraska's Contempt all can't target it either without an extra 2 mana to spare. However, the drawback is serious since the deck runs lots of noncreature spells, and unlike vs. control where just having Nullhide Ferox is good enough, against Golgari, Selesnya tokens wants to keep adding to the board. I sided it in once, to mixed results. There's no reason not to run multiple copies of good legendaries in your deck, it's common practice all around. Also as you don't want Nullhide in Selesnya since the drawback is far greater than the advantage with all the non-creature spells you still need to play. Yes the tokens deck already runs multiple Emmaras & Trostanis. But The Immortal Sun is a 6-mana legend, and there're only so many 6-mana cards you can have. Besides, it doesn't die easily. With Emmara if I really, really need to play another Emmara I can always chump attack; with Trostani if she's sticking on the board I'm probably winning, but there aren't many cards that kill The Immortal Sun. Teferi or Vivien could answer it with their -3's, except they can't even use their -3's. I dunno. I've boarded in The Immortal Sun several times and still haven't drawn it. Also I need to refine that sideboard plan. Maybe I'll start a thread in the main forum about standard sideboard plans against all decks. I dunno. I've boarded in The Immortal Sun several times and still haven't drawn it. That's why I would suggest 2, double your chances And about Nullhide, sure, if you test it and it works, why not! But I have my doubts. Ferox also works against Jeskai and Esper by virtue of it being a big hexproof creature. I did think of Vine Mare but a sideboard card that dies to Deafening Clarion is likely not good enough. Ugh, I need help with sideboarding strategies with this deck. Is Karn good against Golgari? Do I board out Venerated Loxodon whenever I board out Saproling Migration (which is like 100% of the time, it's the first card I cut)? What about boarding out Ajani for the same reason? If I'm cutting Saproling Migration, do I also cut Legion's Landing since both cards share the same weaknesses? And then there's Adanto Vanguard - do I cut that against Golgari (since Golden Demise kills it too)? Kraul Harpooner feels weak against anything except monoblue, so I doubt it's worth a slot. Don't forget the Harpooner kills Lyra with 2 creatures in the graveyard. Not such a weak card. Honor guard is good, there will be a LOT of Golgari, is my bet. Pick also one of the top-end cards, either Carny or Sun (I'd go for 2x Carny, there will also be plenty blue control). Knight of Autumn is also a very good toolbox to have in your SB, 3 seems decent. I would not side in Thorn Luitenant, but some Karn/Vivian (2 in total) can be very good for the grindier matches. A few last slots could be Baffling end, or perhaps Seal Away (depending on if you expect enchantment hate). I think you can trim it down to 15 this way? One question - why don't you play Huatli, Radiant Champion? She seems nice for a go-wide deck. Get to ultimate the next turn she enters, draws you a **** of cards, because the creatures just need to enter the battlefield, don't need to be case. You can pump something to infinity etc. Paying attention to my graveyard, there're usually no creatures there. Looking at the list there are 14 creatures, of which only 3 come into play early and die easily (the Emmaras). Harpooner cannot reliably hit for four damage, which is critical against drakes, so I don't see the point in them. Huatli feels like a win-more card. If I have a big board before I play her, great, I can ultimate next turn and likely win. But if I'm behind or if my board is weak, she's just mediocre. At least Ajani can buff some 1/1 lifelinkers. The latter result isn't much worse. The former result has one extra mana, but what is one going to do with it? The only one-mana spells are Legion's Landing and Flower//Flourish. I suppose one could play another Legion's Landing and have an even better board, but that would go from nut draw to really nut draw. Later in the game Saproling Migration making four bodies could be something, but there are other strong uses for 6 mana - The Immortal Sun, Carnage Tyrant, activating Shalai, activating Thorn Lieutenant, casting big Marches. After that, also thinking of switching out Ajani for Shalai. This definitely makes the deck weaker against control, but that's already a bad matchup (it does make one immune to Settle the Wreckage however). In return this improves the deck against many others, especially monored (lol if they have to nuke themselves with Viashino Pyromancer). 3/4 flyers can also attack through the largely-ground B/G, and block drakes/monoblue flyers as well especially if it's pumped. Losing Ajani means pumping Shalai is harder, but it's still possible with Loxodon & Trostani. Or maybe run one of each 4-drop (Ajani should get better with Thorn Lieutenant as a return-able 2-drop also).